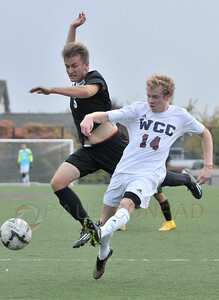 © Paul Conrad/The Bellingham Herald - Shoreline Community College defensiveman Konstantin Reutov (5) battles with WCC forward Conlon Kiffney (14) during the second half on Orca Field at Whatcom Community College in Bellingham, Wash., on Saturday afternoon Oct. 4, 2014. 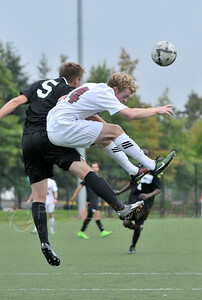 Shoreline defeated Whatcom 1 to 0 with a last minute goal. 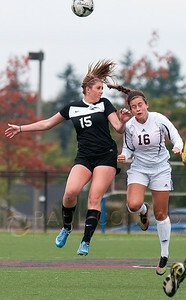 © Paul Conrad/The Bellingham Herald - Shoreline Community Collegeforward Hayley Warren (15), left, goes over Whatcom Community College defensiveman Emily russell (15) during the first half on Orca Field at Whatcom Community College in Bellingham, Wash., on Saturday afternoon Oct. 4, 2014. © Paul Conrad/The Bellingham Herald - Whatcom Community College forward Ashley Hughes (10) battles with Shoreline Community College defensiveman Selene Aguila (7) and Mackenzie Bolton (14) as she heads towards the goal during the first half on Orca Field at Whatcom Community College in Bellingham, Wash., on Saturday afternoon Oct. 4, 2014. 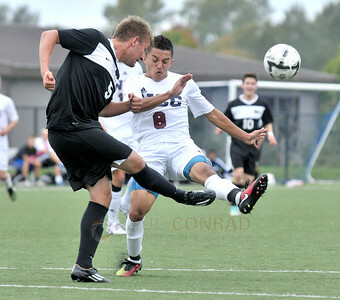 © Paul Conrad/The Bellingham Herald - Shoreline Community College defensiveman Konstantin Reutov (5) and WCC midfielder Emile Diffley (7) battle for the ball during the second half on Orca Field at Whatcom Community College in Bellingham, Wash., on Saturday afternoon Oct. 4, 2014. 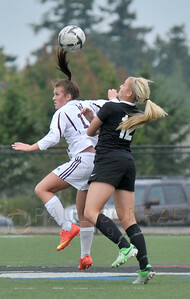 Shoreline defeated Whatcom 1 to 0 with a last minute goal. © Paul Conrad/The Bellingham Herald - WCC freshman midfielder Conlon Kiffney (14) wins the ball from Shoreline Community College defensive men Ryan Anderson (12), left, and Rodrigo Robles (10) during the first on Orca Field at Whatcom Community College in Bellingham, Wash., on Saturday afternoon Oct. 4, 2014. 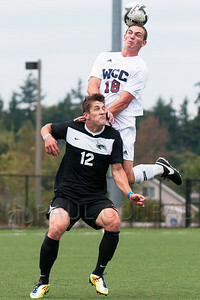 The visiting Shoreline Dolphins defeated the WCC Orcas 1 to 0 by a last minute second half goal. © Paul Conrad/The Bellingham Herald - WCC defensiveman Taylor Alflen (14) heads the ball between Shoreline Community College forwards Sarah Cronin (3), left, and Mercedee Smith (10) during the first half on Orca Field at Whatcom Community College in Bellingham, Wash., on Saturday afternoon Oct. 4, 2014. 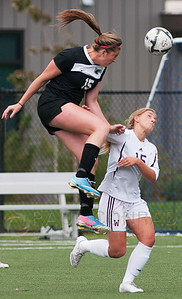 © Paul Conrad/The Bellingham Herald - Shoreline Community College forward Hayley Warren (15) and WCC defensiveman Hannah Mankle (16) battle for the ball during the first half on Orca Field at Whatcom Community College in Bellingham, Wash., on Saturday afternoon Oct. 4, 2014. 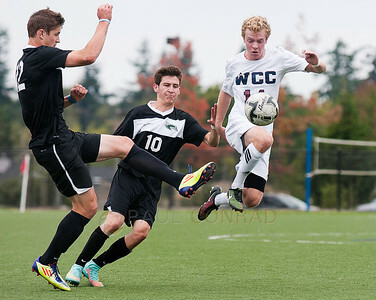 © Paul Conrad/The Bellingham Herald - Shoreline Community College defensiveman Konstantin Reutov (5) attempts to stop WCC defensiveman Canyon Sililman (18) as he approaches the goal during the first half on Orca Field at Whatcom Community College in Bellingham, Wash., on Saturday afternoon Oct. 4, 2014. 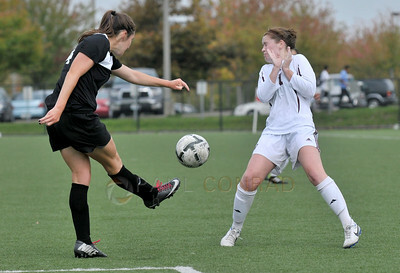 Shoreline defeated Whatcom 1 to 0 with a last minute goal. 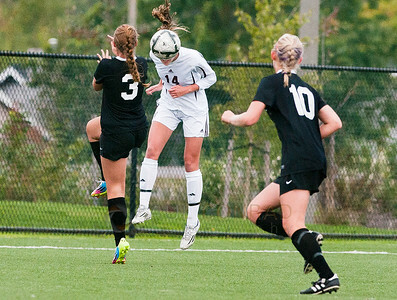 © Paul Conrad/The Bellingham Herald - Images from the woman's Whatcom Community College soccer match against Shoreline Community College on Orca Field at Whatcom Community College in Bellingham, Wash., on Saturday afternoon Oct. 4, 2014. 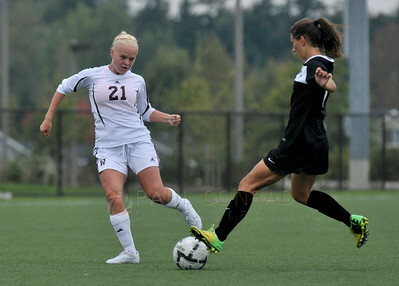 © Paul Conrad/The Bellingham Herald - WCC forward Jade Thurston (11) protects herself from a hard kick by Shoreline Community College defensiveman Mackenzie Bolton (14) during the first half on Orca Field at Whatcom Community College in Bellingham, Wash., on Saturday afternoon Oct. 4, 2014. 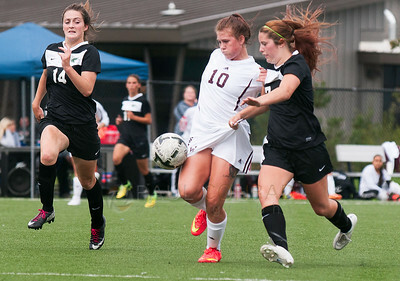 © Paul Conrad/The Bellingham Herald - WCC on Orca Field at Whatcom Community College in Bellingham, Wash., on Saturday afternoon Oct. 4, 2014. 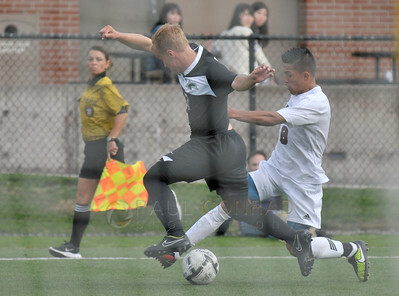 © Paul Conrad/The Bellingham Herald - SCC defensiveman Konstantin Reutov (5) boots the ball from WCC forward Tomas Alvarado during the second half at Orcas Field at Whatcom Community College in Bellingham, Wash. 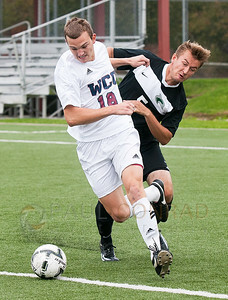 The visiting Shoreline Dolphins defeated the WCC Orcas 1 to 0 with a last minute goal. © Paul Conrad/The Bellingham Herald - Shoreline Community College goalkeeper Kamal Gulaliyev (00) and WCC midfielder Austin Makela (6) go for a corner kick during the second half on Orca Field at Whatcom Community College in Bellingham, Wash., on Saturday afternoon Oct. 4, 2014. 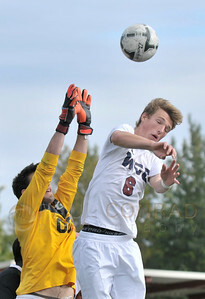 Shoreline defeated WCC 1 to 0 on a last minute goal. 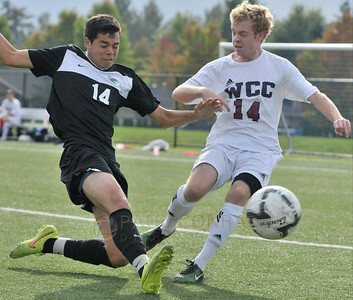 © Paul Conrad/The Bellingham Herald - Shoreline Community Collefe defensiveman Andres Lepe (14) defends against WCC forward Conlon Kiffney during the second half on Orca Field at Whatcom Community College in Bellingham, Wash., on Saturday afternoon Oct. 4, 2014. 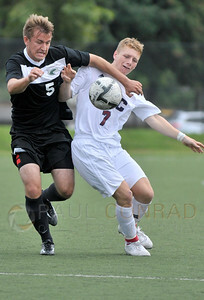 Shoreline defeated Whatcom 1 to 0 with a last minute goal.